Turkey is coming at the IOC from a position of strength. Not only has Istanbul become the go-to destination for Middle East travelers and Europeans in the know, but it can point to Rio’s Olympics/World Cup hosting as proof a city can do two things at once. Turkish Prime Minister Tayyip Erdogan will travel to London for the Olympics starting next week to push for Istanbul’s bid to host the 2020 Games, bid officials said on Saturday. Istanbul is bidding alongside Madrid and Tokyo for the 2020 summer Games with a decision to be taken by the International Olympic Committee in September 2013. Turkey’s largest city, however, suffered a setback in April when the country also announced it was bidding for the 2020 Euro soccer championship, triggering the ire of the IOC. 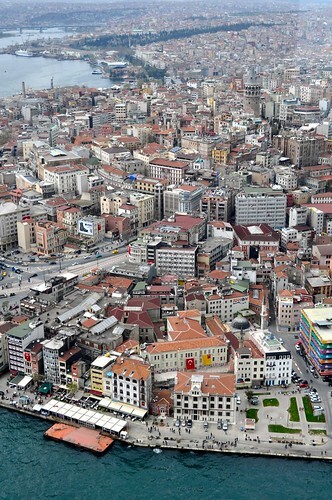 Aerial view of Istanbul, Turkey. Photo by Sarah Murray. “We believe that having our Prime Minister in London as part of the team sends a powerful message to the Olympic family: ‘Istanbul 2020 is a national priority supported by all levels of government and across the political spectrum’,” said Istanbul bid chief Hasan Arat in a statement. Arat said Erdogan would be attending Olympic competitions involving Turkish athletes and would also have meetings with the British government. He did not give any dates of Erdogan’s visit. The IOC is not sympathetic to the idea of an Olympic host nation holding another major sporting event in the country in the same year as the Games due to potential preparation problems and sponsor issues that could arise. It has warned Turkey it would need to drop its Euro bid if Istanbul, bidding for the fifth time in the last six votes, are awarded the Games next year.